Readers of this intriguing and gripping story will realise that its central character, Maisie, is unusual when she wakes on her tenth birthday longing for presents that will help her build her own nuclear reactor. Maisie is academically gifted, home educated and studying for a degree in mathematics and physics at the age of ten. These gifts lead to loneliness as Maisie longs to be more like other children, to be more independent and, most of all, to be closer to her fifteen-year old sister Lily, who feels threatened and overshadowed by Maisie. But this is no ordinary birthday. The short chapters alternate between Maisie's birthday in the "real" world and a very disturbing birthday in a parallel reality where Maisie is all alone in the house as a sinister blackness threatens to engulf her home and Maisie herself. 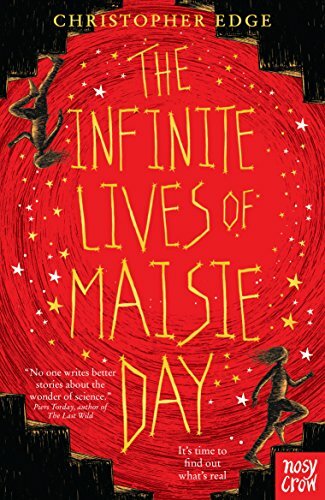 As Maisie struggles with an expanding universe, black holes, the prospect of infinite lives and disturbing memories, Christopher Edge skilfully draws the reader into a fascinating and unsettling blend of science and fiction where they will confront big ideas on the nature of the universe and existence, infinity and virtual reality. At the same time, the author reveals the sad truth of what happened to Maisie on her birthday and the consequences of sibling rivalry and grief, and the power of love. This accomplished book will take its audience of 10+ readers by surprise and should both challenge and enthral them with its tense, affecting mix of science, thrilling mystery, uncertainty and emotion. This is powerful material, well delivered.